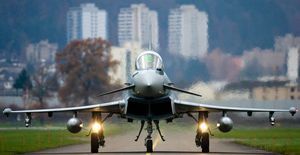 Swedish defence group Saab yesterday admitted that millions were paid to clinch a South African contract for fighter jets - but claimed its erstwhile British partner, BAE Systems, had paid the bribes. Saab said R24-million had been paid by BAE in the form of bonuses and salaries between 2003 and 2005 for the deal involving 26 JAS Gripen fighters. The comments came after Swedish TV channel TV4 said it had evidence that Saab had promised to pay Fana Hlongwane, then adviser to then South African defence minister Joe Modise, millions of rands in bonuses if Pretoria did not back out of the Gripen deal. Hlongwane also served as a consultant for the Swedish firm. Saab said R24-million was paid by its South African subsidiary Sanip, then controlled by BAE Systems. Saab president and chief executive Haakan Bushke denied responsibility: "A person employed by BAE systems has, without Saab's knowledge, signed for us an unknown contract, signed for us up until now unknown transactions." BAE Systems said last week it had sold its stake in Saab. The 1999 deal provided for the sale of 28 jets for R17.7-billion but this was later reduced to 26. The last plane is due to be delivered next year. Cape Town mayor Patricia de Lille, who blew the lid on the arms deal as a member of parliament in 1999, said last night: "I can just say I have been vindicated." "I have always said the ANC government must learn that you can never hide the truth. Now, the truth has leaked out in Germany, in the UK, and now in Sweden as well." De Lille said: "This case was the only reason why the Hawks was established; its sole purpose was stopping the arms deal investigation and [it has] failed hopelessly." The Hawks, after assigning a single investigator to the case, dropped its probe last October. Hawks spokesman McIntosh Polela did not answer his phone last night. The NPA refused to comment. Leonie Foster, spokesman for BAE Systems in the UK, said: ''These and other matters were fully reviewed by the [UK's] Serious Fraud Office and formed part of the overall resolution that the company reached with the SFO in February 2010." The firm pleaded guilty to a charge of breach of duty to keep accounting records in relation to payments made to a former marketing adviser in Tanzania and agreed to pay a £30-million fine. With acknowledgements to Sapa, Nicki Güles, Andile Ndlovu and Sunday Times.